Fewer 999 ambulance calls will be classed as life-threatening and needing a super-fast response in the biggest shake-up of the service in 40 years. The move by the NHS in England - and agreed by ministers - will result in about 8% of call-outs being classed as needing the quickest response. Currently half of call-outs are, but many are not serious or could wait longer for paramedics to arrive. NHS bosses said it would free up crews to reach the sickest more quickly. They said the targets that were being used now were "blunt" and "dysfunctional" and meant too many ambulances were being dispatched just to meet targets rather than prioritising patients appropriately. Wales has already introduced a similar system, while Scotland is piloting its own version. Under the changes, call handlers will also be given four minutes before they need to send out a crew to assess what the patient needs - currently they have only 60 seconds. Combined with fewer patients being classed as life-threatening, the pilots suggest this will create an efficient system and will put no patients at risk. Currently about a quarter of life-threatening calls do not end up needing hospital treatment, but the rush to hit the eight-minute target to reach them can see multiple crews dispatched - one in four "blue-light" calls are stood down before they reach the scene. However, it does mean some patients who should have received an eight minute response, such as those who have suffered a stroke, could now wait 40 minutes. Doctors, though, argue what is more important is that they get the right treatment in hospital - and this will now be more closely measured under the new system of targets. Prof Keith Willett, of NHS England, said one of the problems with the current system was that crews were being unnecessarily dispatched to "stop the clock". "This has led to the inefficient use of ambulances, with the knock-on effect of hidden waits," he explained. These hidden waits are essentially where a first responder bike or car arrives when an ambulance is needed. Currently an estimated one million people a year - one in four of those who need transporting to hospital - find themselves in this situation. The new system will also measure average waits for life-threatening and emergency cases - this is to ensure that every call out counts towards the target. One of the criticisms of the existing system is that once the target time has been missed there is less incentive to get a crew to the patient quickly. The changes will be rolled out across the service by the autumn after pilots in three of England's 10 ambulance services. 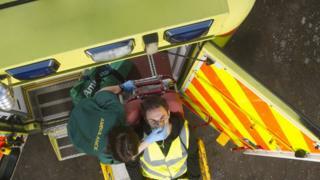 College of Paramedics chief executive Gerry Egan said he was "fully supportive" of the move. "It is vital to patient care that paramedics are targeted to the most appropriate patients." And Juliet Bouverie, of the Stroke Association, said even though stroke patients may wait longer for that first response, she thought the changes would be beneficial. "Under the current system, the first responder to a stroke patient could be on a motorbike - but this vehicle can't transport the patient to hospital meaning they have to wait even longer for an ambulance to arrive. "By allowing ambulance call handlers a little more time to determine what is wrong with a patient, it ensures that stroke patients can be identified and the right vehicle sent out immediately to get the patient to a stroke unit."